How to be a great team player. 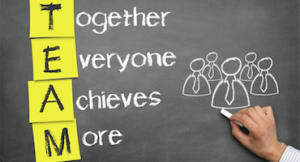 One of the most important benefits of having a cohesive team is synergy; the total is more than the sum of its parts. When a team is working well together, more gets done, and the process is more enjoyable. In essence, everybody benefits. Following are some simple guidelines to help keep a team in the flow, how to approach someone when there is a challenge, and how to respond to being critiqued by others. Be Loyal To Those Not Present – No one likes to be talked about behind their back, and we should not tolerate people talking bad to others in our presence. Do More Than Your Fair Share – No one likes working with someone who says, “That’s not my job.” Develop a reputation for being someone that will do “Whatever it Takes” to get the job done. Be Dependable – Get in the habit of being where you are supposed to be, when you are supposed to be there, and ready to do the job. Anticipate Your Partners Next Move – Good teammates rarely need to tell the partner what to do next because they are already doing it. Don’ t Vent Out Or Down…Only Up. Then Don’ t Vent…Explain – Nothing is worse for morale than whining or venting to people who aren’t in a position to solve the problem. Go to the source and then explain your viewpoint in a logical, unemotional manner. Be Flexible – Sometimes it is okay to do it someone else’s way. When Giving An Assignment, “Ask, Don’ t Tell” – No one likes to be told what to do, but most everyone is glad to help out when asked. When Getting An Assignment, Have An “I’ ll Be Glad To” Attitude – Be open to input. Practice Non-Judgement – We are all different, with varied strengths and weaknesses. Being judgemental undermines individuals. Pick Your Battles – The Pope says, “See Everything, Overlook A Lot, Correct A Little” – If you always have to be right, people will tend to resent you and be resistant to your ideas. When At Work, Put Your Game Face On – We all have personal challenges that we deal with on a regular basis, but when you get to work, leave them at the door.